top Adopted 1981 and in force since 1984, this convention covers the marine environment, coastal zones and related inland waters falling within the jurisdiction of the states of the Western African Region, from Mauritania to South Africa. top Signed 1996, under the Bonn Convention (CMS), ACCOBAMS entered into force in 2001. It applies to coastal Mediterranean and Black Sea countries.Annex 1 lists the cetaceans of the Mediterranean, Black Sea and Atlantic Contiguous Area. top Signed 1991, under the Bonn Convention (CMS), ASCOBANS entered into force in 1994.It originally covered small cetaceans in the Baltic and North seas, but by 2008 it was extended west to cover the Northeast Atlantic, including the Irish Sea. The aim of the agreement is to promote close cooperation among countries to protect small cetaceans - dolphins, porpoises and beaked whales - in this region. The agreement does not include the larger whales. top Established under UNEP in 1975, the Barcelona Convention was amended in 1995. The Mediterranean Action Plan (UNEP/MAP) applies to all Mediterranean coastal states. top This regional association of Greater Caribbean countries was formed with the adoption of the Cartagena Convention in 1983 but not ratified until 1986. It is the key environmental treaty in the wider Caribbean. top Formulated in 1980, CCAMLR has been in force since 1982 with the objective of conserving living resources in the Southern Ocean. CCAMLR is an important tool as it promotes research and analysis, partly through an ecosystem-based management approach. top Formulated under UNEP in 1973, CITES has been in force since 1975 and has worldwide application.CITES regulates international trade (all international movements for whatever purpose) of species listed on three appendices. top Established by UNEP in 1979 and entering into force in 1983, CMS conserves 'entire populations or any geographically separate part of the population of any species or lower taxon ... a significant proportion of whose members cyclically and predictably cross one or more national boundaries'. A key operative function of CMS is the creation of regional agreements for the conservation of migratory species. As of 2010, with seven instruments focusing on marine mammals, four of which are cetacean agreements, CMS holds a leading global and regional role in marine mammal conservation.For cetaceans, see Appendix I (Migratory species in danger) and Appendix II (Migratory species with an unfavourable conservation status requiring international cooperation for conservation and management). top Formulated in Apia in 1976, CNSP entered into force in 1990.
top The CBD, legally binding since 1994, is the most widely supported of all international agreements, with more than 145 countries now party to the convention. It is the first comprehensive international agreement committing governments to protect the Earth's biological resources through the conservation and sustainable use of biodiversity.The CBD, in Article 8, calls on parties to 'as far as possible and as appropriate, establish a system of protected areas or areas where special measures need to be taken to conserve biological diversity'.State parties are asked to take measures to ensure the conservation and sustainable use of biodiversity, to monitor biodiversity in their territories, to identify and take measures for the control of destructive activities, and to integrate consideration of biodiversity within national decision-making.Article 4 states that the CBD applies in areas within national jurisdiction, the EEZs, as well as beyond the limits of national jurisdiction for processes and activities carried out by a member state, regardless of where their effects occur, such as on the high seas. Article 5 adds that states must cooperate with other contracting states, as far as possible and appropriate, in areas beyond national jurisdiction.In 1995, the Jakarta Mandate developed a programme of action for implementing the CBD in terms of marine and coastal biodiversity. Establishing marine and coastal protected areas is one of the five main tenets of the agreement, allied to provisions calling upon states to implement integrated coastal area management and to ensure the sustainable use of coastal and marine living resources. top Formulated by the European Community Council in 1992, the EU Habitats Directive (also known as the EU Habitats and Species Directive; full name: Council Directive 92/43/EEC of 21 May 1992 on the conservation of natural habitats and of wild fauna and flora) applies to all EU states, including the Azores and Madeira (part of Portugal) and the Canary Islands (part of Spain). Parts relevant to cetaceans include: Annex II (Animal and plant species of community interest whose conservation requires the designation of special areas of conservation - SACs), which, for cetaceans, has only bottlenose dolphins and harbor porpoises; Annex IV (Animal and plant species of community interest in need of strict protection), which covers all the cetacean species in the marine areas of the European Union (EU); and Annex V (Animal and plant species of community interest whose taking in the wild and exploitation may be subject to management measures). Natura 2000 is the programme to create a network of protected areas across the entire European Community. top This 1992 convention protects Baltic marine waters from pollution partly through creating a system of marine and coastal protected areas. top Signed in Washington, DC, in 1946 and in force since 1948, ICRW had some 88 nation members (as of 2011) who are parties to the convention and belong to the IWC. According to ICRW, whale species are protected from overfishing; but there is debate over the definition of 'whale' and whether it includes small cetaceans. The convention provides for the adoption of regulations designed to open and close waters, including the designation of sanctuaries on the high seas where no whaling is allowed, under Article V of the convention. Approval of a sanctuary through an amendment to the schedule requires a three-quarters majority vote. Currently, two ocean sanctuaries are in place: the Indian Ocean and Southern Ocean. top Adopted in 1982 and in force since 1985, Jeddah Convention parties have established the Programme for the Environment of the Red Sea and Gulf of Aden (PERSGA). top The Kuwait Convention was adopted in 1978 and has been in force since 1979.
top In force since 1986, CPPS is implemented under the guidelines of UNEP OCA/PAC's Action Plan for the Protection of the Marine Environment and Coastal Areas of the South-East Pacific. CPPS includes the countries of Chile, Colombia, Ecuador, Panamá and Peru. top Drafted in 1973 and in force since 1978, IMO is a UN forum on shipping issues which formulates international regulations on shipping. IMO recognizes its responsibilities to limit adverse environmental impacts from shipping. IMO can designate particularly sensitive sea areas (PSSAs) within EEZs or on the high seas to protect significant ecological, socioeconomic or scientific features that may be vulnerable to damage by maritime activities (MPA News, 2002a).Candidate PSSAs can be suggested by member states, and are then reviewed by the Marine Environment Protection Committee. Guidelines list ecological, social, cultural, economic and scientific criteria to be met before an area can be designated a PSSA. top Instituted in 1978 in Ottawa, NAFO has been in force since 1979.
top Adopted in 1985, the Protocol Concerning Protected Areas and Wild Fauna and Flora in the Eastern African Region entered into force in 1996.
top Adopted at Noumea in 1986, the Noumea Convention entered into force in 1990 as the umbrella agreement for the protection and management of the marine and coastal environment of the Pacific Islands Region. top Environment ministers of 15 Northeast Atlantic states and the members of the European Commission agreed in 1998 to identify marine species, habitats or ecosystems that need protection and to 'promote the establishment of a network of marine protected areas to ensure the sustainable use and protection and conservation of marine biological diversity and its ecosystems'. They signed Annex V to the OSPAR Convention and adopted the Strategy on the Protection and Conservation of Ecosystems and Biological Diversity of the Maritime Area. Annex V (on the Protection and Conservation of the Ecosystems and Biological Diversity of the Maritime Area) promotes the establishment of specific areas needing protection and management of human activities in these areas, while Appendix 3 provides the Criteria for Identifying Human Activities for the Purpose of Annex V.
top Launched in September 2006, the Pacific Cetaceans MoU was negotiated under the auspices of the Convention on Migratory Species (CMS), in collaboration with the South Pacific Regional Environment Programme (SPREP). top Initiated in 1952 to regulate catching of large baleen and sperm whales in the South Pacific, PCSP was the first international agreement to claim jurisdiction over all marine resources, including the sea floor within 200nm (370km) of the coast. top The full title of the UN Fish Stocks Agreement, which came into force Dec 2001, is The United Nations Agreement for the Implementation of the Provisions of the United Nations Convention on the Law of the Sea of 10 December 1982 relating to the Conservation and Management of Straddling Fish Stocks and Highly Migratory Fish Stocks. It builds upon and fills gaps in UNCLOS to manage fish species throughout their range between EEZs and the high seas, or migrating over long distances in the high seas. It recognizes the 'biological unity of the stocks'. top MAB was set up through the United Nations Educational, Scientific and Cultural Organization (UNESCO). Biosphere reserves provide a valuable model for MPA conservation by combining the conservation, logistic and development roles and by using a combination of highly protected IUCN Category I core areas, along with surrounding areas which integrate the needs of local populations and are less protected transition areas. This model has been widely used by protected areas whether or not they are called 'biosphere reserves'. top Called Earth's Action Plan, Agenda 21 is a practical manual and blueprint for sustainable development negotiated and adopted by all participating states at UNCED in June 1992.
top Initiated in 1982 in New York, UNCLOS entered into force in 1994, after ratification by 60 countries.UNCLOS, often referred to as the Law of the Sea, gives all coastal states the right to extend their territorial sea from the former 3nm (5.5km) to 12nm (22.2km); in practice, many nations had already done this. Most important, it also gives countries the right to declare a marine EEZ up to 200nm (370km) from the coast as well as from national islands off the coast, and up to 350nm (649km) from the coast where a continental shelf extension can be established. Coastal states have management jurisdiction over their EEZ, including the management of both living and non-living marine resources. Other norms of high seas law, such as right of passage, apply. The regime of the high seas (outside the EEZs) dictates that all states have the right to engage in fishing, subject to treaty obligations and the rights of other states. UNCLOS also has relevance to areas outside the national EEZs and to high seas MPA creation. UNCLOS is a living treaty, subject to modification and elaboration. top 'States have the obligation to protect and preserve the marine environment' (Article 192).States have the right to exploit their natural resources but it must be done in accordance with their environmental policies and duty to protect and preserve the marine environment. States shall act individually or jointly as appropriate to take all measures necessary for conservation, using the best practical means at their disposal.States shall take measures to ensure that activities under their jurisdiction or control are so conducted as not to cause damage by pollution 'beyond the areas where they exercise sovereign rights'. This also means that a state is responsible for the activities of vessels flying its flag on the high seas.States shall take measures to deal with all sources of pollution of the marine environment. States must take measures to protect and preserve 'rare or fragile ecosystems as well as the habitat of depleted, threatened or endangered species and other forms of marine life'. top The states' freedom to fish on the high seas is limited both by the right of other states to fish and their duty to cooperate 'as may be necessary for the conservation of the living resources of the sea'.With the right to fish comes the responsibility to respect the rights of other states and to ensure that the stocks do not become depleted. Overfishing is not permitted. States shall cooperate to establish subregional or regional fisheries management organizations and to take measures 'which are designed, on the best scientific evidence available ... to maintain or restore populations of harvested species at levels which can produce the maximum sustainable yield'.States, together and/or through the regional fisheries management organizations, can adopt any measures negotiated and deemed necessary for the conservation of fish stocks. top In effect since Oct 2008, this MoU covers small cetaceans and manatees but not large whales, although the agreement could be expanded later to include whales. top Formulated through UNESCO in Paris, in 1972, WHC has been in force since 1975. WHC is responsible for helping to protect cultural heritage as well as the world's most important natural habitats of threatened animals, and sites of outstanding scientific or conservation value. top An action plan was agreed to by 189 countries attending the 2002 meeting in Johannesburg, South Africa. WSSD recommended the establishment of MPAs worldwide under international law and based on scientific information, including representative networks of MPAs, by 2012. WSSD recommended depleted fish stocks to be restored by 2015, with elimination of all subsidies contributing to illegal, unreported and unregulated fishing. 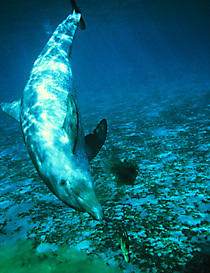 Regular reporting and assessments of the state of the marine environment are to be made a regular process under the UN. The Global Forum on Oceans, Coasts and Islands was formed with national and international conservation groups and other organizations, and government representatives working on marine initiatives, to confer regularly to ensure that the initiatives, targets and timetables of WSSD are met. Source: Table 3.1 from Hoyt, E. 2011 Marine Protected Areas for Whales, Dolphins and Porpoises. Earthscan, London and Washington, DC. All rights reserved.